Kenneth Purvis Mackenzie was born on March 10, 1934 in Gore Bay, Ontario, Canada located on the North channel of Lake Huron. 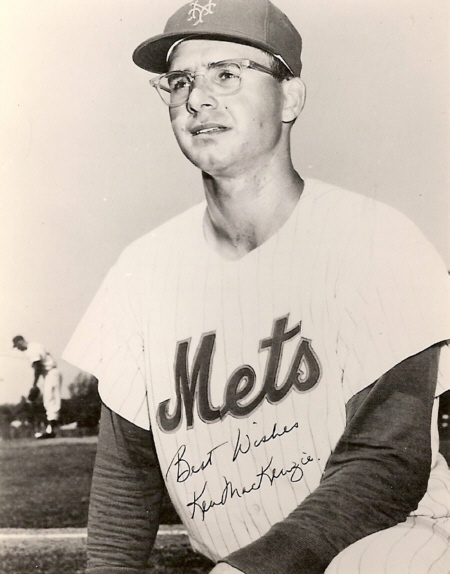 The man with the thick glasses looked more like a scholar than a ball player, and he actually was. He was a member of the Yale class of 1956, lettering in both baseball & hockey. 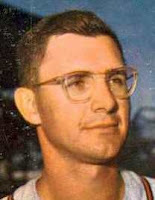 Mackenzie was a six foot left hander was signed by the Milwaukee Braves in 1957. He went right to AA ball pitching in Atlanta winning 14 games. In his move up to AAA the following year he won 15 games making an impression. In 1959 he became relief pitcher mostly going 6-2at AAA Louisville making a debut in the big leagues by 1960. He saw action in just 14 games over two seasons in Milwaukee going 0-2 as a Braves reliever. In October 1961, his contract was purchased by the New York Mets making him an original Met. MacKenzie was a reliever for the ’62 Mets staff, usually coming in the later innings. Once in a tight game with runner aboard Casey Stengel came out to the mound & told Mackenzie “make out like your pitching against Harvard”. He would be the first Mets pitcher out of Yale University, until Ron Darling came along twenty years later. Casey was also quoted saying: "He's a splendid young fella with a great education from Yale University. His signing with us makes him the lowest paid member of the class of Yale '56." 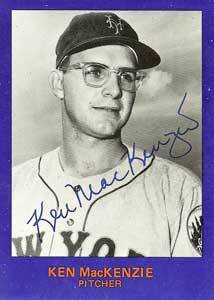 Mackenzie made his Mets debut in the fourth game of the teams history, on April 15th 1962 at the Polo Grounds. He relieved Roger Craig in the 4th inning & pitched two innings, allowing a pair of runs on three hits. On May 4th he took a loss at Philadelphia, when Tony Taylor doubled in the 6th inning with what was the games winning run. After recording a blown save in mid May, he went on to earn two straight victories in relief, against his old team the Braves, on a road trip to Milwaukee. On May 19th he benefited from a rare Mets hitting outburst, as the team scored four runs in the top of the 8th inning leading to a 6-5 win. The next day, also in Milwaukee, he got more help, when the Mets scored four runs in the top of the 9th inning. Two of the runs scored on an error on Charlie Neal ground ball. Mackenzie would actually close out the year winning three of his last four decisions as well. On a team that only won 40 games, MacKenzie pitched in ten of those wins. 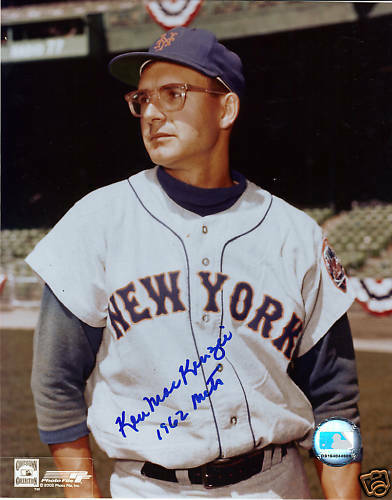 He was the only pitcher on the entire 1962 Mets staff with a winning record (5-4) & his five wins were amazingly third best on the team. He made 42 appearances earning one save, striking out 51 batters & walking 34 while allowing ten HRs, in 80 innings pitched, posting a 4.95 ERA. 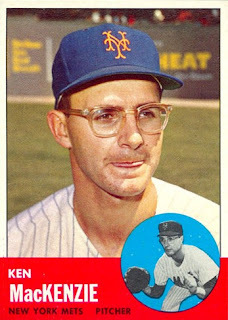 He started out real well in 1963, earning a pair of wins at the Polo Grounds, once again against his old Braves team mates. He was 3-0 with two saves, posting an 0.69 ERA, with 13 strike outs 12 innings of work, by early May. He was by far the most successful pitcher on the Mets staff early on. Mackenzie would make 34 appearances, going 3-1 while blowing two saves, through early August. On August 5th he was then traded to the St. Louis Cardinals for Ed Bauta. Mackenzie would finish the year at 3-1 with 4.84 ERA, striking out 48 batters in 67 innings on the season. Over the next two years he would pitch for the San Francisco Giants & Houston Astros, going 0-3 in 31 games combined. In his six season career he was 8-10 with five saves, 142 strikeouts & 63 walks in 208 innings pitched. MacKenzie started just one career game, making 129 appearances posting a 4.80 ERA. Retirement: After his playing career he was the baseball coach at Yale University from 1969-1978. The following season future New York Mets pitcher Ron Darling would pitch for Yale.